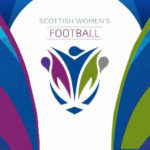 Scottish Women’s Football (SWF) was saddened to learn of the passing of Katharina Lindner (Kat) this weekend. Kat’s involvement in the Scottish women’s game was hugely influential, both as a player and as a individual who helped shape the future of the sport. 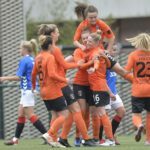 Her career at Glasgow City FC, where she won five Premier League titles, two Scottish Cups and two League Cups, saw her widely regarded as one of the greatest ever players in the Scottish game. Kat was also an SWF Board Member, sitting as Policy Director from 2014 to 2016. 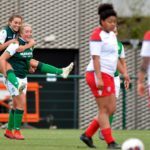 In this role, she oversaw many improvements to the game, including the restructuring of the Scottish Women’s Premier League for the 2016 season. From everyone at SWF, our heartfelt condolences go out to everyone at Glasgow City FC and Kat’s family and friends at this difficult time. To celebrate Kat’s influence on the game, SWF requests that a minute of silence is held at all senior matches this weekend (Saturday 16th or Sunday 17th February).